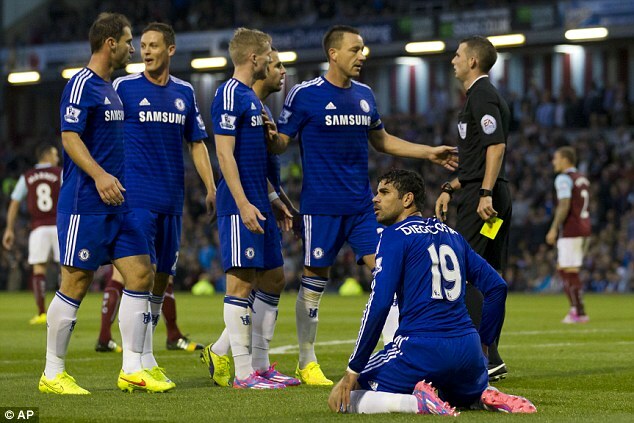 How many times do us fans have to deal with the antics of Jose Mourinho and his Chelsea players? How often do we need to put up with seeing a sea of blue surrounding a referee? Or having to listen to more drivel being spilled from Mourinho’s mouth? I, for one, am sick of it, but even more than that, I’m sick of how the media continue to buy into it and give him the headlines. I suppose that by writing this I’m just adding to the narrative, but I feel that the childishness of their acting must be pointed out. Mourinho is perhaps the most calculating manager in world soccer. Nothing he does is not without a reason, right down to his running the length of the pitch and celebrating with his players. As a matter of disclosure I will say that I don’t like Mourinho. He’s a great manager, as close to a tactical genius that you will find in world soccer, but I cannot stand the playacting and constant stream of hyperbole. Even more than that I hate how the media, and so many fans, buy into it. Time and time again you hear other managers and pundits talk about how detailed he is. With that in mind, I want you, the fan, to remember this the next time he comes out with one of his “emotional” press conferences. He knows exactly what he is saying and how it will come across, not to mention, what headlines will be generated. Pay attention to the headlines following their next defeat or poor performance. He continues to play the media and spin his propaganda time and time again. Blaming the referees was meant for one purpose: to influence the decisions they give to Chelsea and how they will treat his players. The FA should charge him for his most recent comments about referees. He was clearly trying to influence their decision making against his side. It will be infuriating if the FA doesn’t give him a harsh penalty, but it seems unlikely that he will get anything more than a small fine akin to one of us fans having to fork over $5. Until there are strict punishments for these continued comments they will continue. The thing is, he has a long, LONG history of doing this. I still remember the Manchester United v Porto Champions League matches. The amount of diving and dirty play from the Porto players was distressing and this is yet another theme for a Mourinho team. Remember how detailed he is in preparations? Well, this diving, fouling, playacting, and borderline dirty play is something that continues to follow his teams and it leads to only one conclusion: he is instructing his players to do this. If you note the image above you should recognize this situation. Every decision that ever goes against Chelsea is followed by 3, 4, 5, 6, or more Chelsea players surrounding the referee. This too is almost certainly an instruction from Mourinho. I can’t imagine it’s something that is given as a directive before every match, but is instead set as a standard early on and then becomes a habit that continues to occur every match. It’s annoying and it needs to be stopped, but to do so, the media, referees, and FA need to start doing something about it. Until there are punishments for these behaviors they will continue. One last thing to note when watching Chelsea is to pay attention to the number of fouls that they commit in key areas of the pitch. I couldn’t find definitive statistics to back this up, but most of the fouls they give up are in areas and times that interrupt an opponents attack. They do very well in spreading around the yellow cards as well. The only problem comes when their players get booked for diving. They do lead the Premier League (rightly or wrongly) in yellow cards received for diving with four (the next closest team has two). I hope that you as a viewer note all of this the next time you watch a Chelsea match or read/hear a Jose Mourinho interview. TIme and time again Mourinho sets up a mentality of “us against them.” This is most certainly a calculated tactic and don’t forget how often he and his team work to manipulate the referees to give themselves an edge.